The US Army’s Military Open Simulator Enterprise Strategy (MOSES) and AvaCon have announced the first Federal Consortium of Virtual Worlds (FCVW) workshop, which will take place in a specially built virtual conference centre on Friday, March 6th and Saturday March 7th, 2015. The workshop will be an active experience, with on-line exhibits and presentations provided in an interactive manner. Workshop participants are encouraged to engage and interact with the presenters, and the exhibits will range from cultural training material in a mock village to scientific ethical dilemmas in a city landscape. Virtual world technology has matured significantly and rapidly over the past eight years to the point where hundreds of people are able to simultaneously participate in an on-line event. The workshop is open to military and civilian personnel, including the public. The conference will be held entirely within an Open Simulator virtual environment, and reservations will be free for attendees. In addition, the Knowledge Transfer track seeks public sector participants for a panel entitled Public Service Education in Virtual Worlds: Past, Present, and Future, which will discuss public service education uses for virtual world learning simulations as well as will feature panelists’ views on public service virtual world education projects from the past, present, and future. Participants in this discussion will be able to showcase relevant Open Simulator virtual world learning simulations via OAR and IAR uploads to be coordinated with the workshop organisers. Full details on the above tracks, including information on areas of interest applicable to each of them, can be found in the workshop Call for Proposals page of the official website. Proposals must be received by the organisers by Monday, January 5th, 2015. The Federal Consortium for Virtual Worlds (FCVW) supports individuals and organisations from government (federal, state, local, and international), academia, and corporate sesectors to improve government collaboration through the use of virtual worlds, enrich collaborative online experiences, explore technologies that may enhance telework, and foster cross-agency collaboration. AvaCon, Inc. is a 501(c)(3) non-profit organisation dedicated to promoting the growth, enhancement, and development of the metaverse, virtual worlds, augmented reality, and 3D immersive and virtual spaces. We hold conventions and meetings to promote educational and scientific inquiry into these spaces, and to support organized fan activities, including performances, lectures, art, music, machinima, and much more. Our primary goal is to connect and support the diverse communities and practitioners involved in co-creating and using virtual worlds, and to educate the public and our constituents about the emerging ecosystem of technologies broadly known as the metaverse. Last week saw the US Army’s MOSES virtual environment, operated by the Simulation & Training Technology Center (STTC), out of Florida, undergo a major upgrade. During Wednesday and Thursday the 26th & 27th October, the MOSES system was offline to enable the environment to be migrated to a new server platform and network with the capability to support thousands of regions. Prior to the upgrade, participants in MOSES were advised to create full OAR backups of their estates as an additional safeguard against mishaps in the migration process. Users were also informed that post-migration, all of their landmarks would need to be deleted and replaced, as the MOSES world centre had been relocated to allow for future hypergridding activities. The migration also gave the STTC the opportunity to re-arrange MOSES into a series of sub-continents focused on the larger projects hosted on the system, with individual regions within the sub-continents renamed by either estate or project name. The sub-continents themselves remained connected to one another by means of water sims and open spaces, in order to continue to present MOSES as a single continuous mass of land and water. “We have been observing 2 sims that have roughly the same amount of prims (10,000). Testing has revealed these heavier sims requires at least 50% of a processor and 1Gb of ram to support a meeting of 20 people. The older hardware appears to have been dual-core HP servers supporting approximately 120 regions running on 60 CPU cores.These older servers are still used within the new set-up, but are now restricted to providing open water and spaces connecting sub-continents. The new servers average 8-core servers with 64Gb of memory and 80 GB hard drives. While MOSES was back online on Friday 28th October, the migration work was continuing, with the expectation it would take a few days to complete. However, as of Friday 28th, users were being invited to log back into the system to attend the weekly MOSES Office Hours and try-out the new sims as they became available. MOSES is still accepting new accounts from suitable parties. These are obtained via the MOSES website, and are vetted by Douglas Maxwell for suitability. While priority is obviously given to military projects, proposals don’t have to be within the military arena in order to gain access to the system. On Friday 23rd September, Nonprofit Commons (NPC) hosted a presentation by Douglas Maxwell, Science and Technology Manager for Virtual World Strategic Applications at the U.S. Army Simulation & Training Technology Center (STTC), who was speaking at Plush Nonprofit Commons in Second Life. He was there to specifically discuss MOSES – the Military Open Simulator Enterprise Strategy – although his talk broadened to covered other aspects of the STTC’s work. 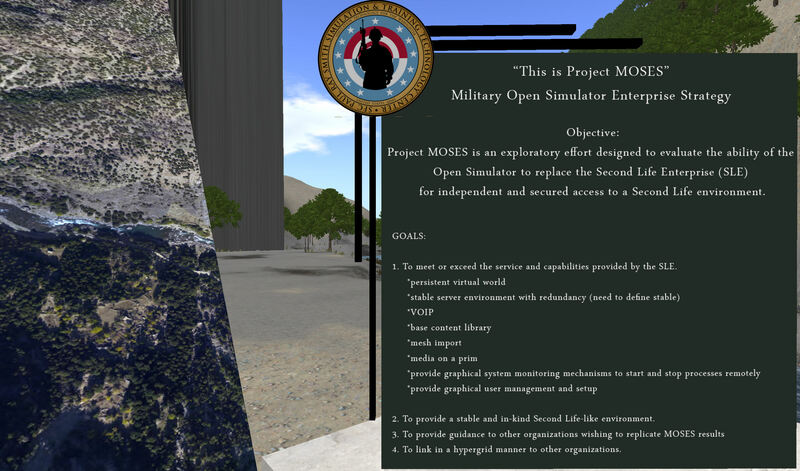 MOSES is a project aimed at evaluating the use of OpenSim as a means of providing a virtual world-based simulations and research environment available for use by relevant parties both within and without the U.S. Department of Defense. It grew directly out of the STTC’s involvement with the Second Life Enterprise product. Currently overseen by Colonel Craig G. Langhauser, the STTC – Full name, the SFC Paul Ray Smith Simulations Training and Technology Center, in memory of posthumous Medal of Honor recipient Sergeant First Class Paul Ray Smith, killed in 2003 during Operation Iraqi Freedom – was officially founded in 2002, with a heritage stretching back over the last two decades related to the use of simulator-based training technologies. Located in Orlando, Florida, the unit’s stated mission is to: Enhance Warfighter readiness through research and development of applied simulation technologies for learning, training, testing and mission rehearsal. 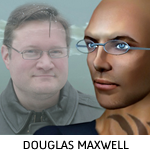 As the Science and Technology Manager at STTC, Douglas Maxwell (SL name: Maccus McCullough) is no stranger to the use of computer simulations, having started out in the mid-1990s, when he was hired by the US Navy as a civilian specialist to work in their Virtual Reality labs in Washington DC. It was there that he realised people were becoming more immersed in simulations, “It isn’t logical to duck when a virtual object is flying at you, but they did,” he explained to the audience at the presentation. This led Maxwell to write a paper how PC clusters could be used for simulation work at a much lower cost than that associated with high-end, dedicated systems, while also offering the same flexibility of use in creating and modifying scenarios. A paper which didn’t win him a popularity award, as he noted wryly to the audience, “I got some hate mail for that one!”. In 2008 Maxwell and his team started investigating virtual world environments as possible platforms for research, looking at OpenSim and Second Life. They immediately drawn to what they found in SL. “It is a computationally steerable persistent simulation,” Maxwell explained to his audience. “The capabilities in here are tremendous: in situ scripting, terrain deformation in real-time, every object is composable, not static. We got the idea that if we could increase the fidelity of the physics in here, it could actually be very useful”. As a result of these explorations, Maxwell engaged with Linden Lab to address issues of security and data integrity for simulations, the company steering Maxwell’s team towards the Second Life Enterprise product. Simultaneously, he established the 12-sim Naval Underwater Warfare Center campus within Second Life itself – used more as a promotional tool than for simulation work. Alongside of this, Maxwell and his team brought the source code rights to an entire commercial 3D gaming system which they used to develop EDGE-P – the Enhanced Dynamic Geosocial Environment Platform – an advanced virtual environment used to provide real-world operational environment training. EDGE enables personnel from different locations to be brought together and trained in a wide range of scenarios, including homeland security and preparation for overseas posting. During his NPC presentation, Maxwell invited his audience to watch footage from an EDGE simulation held in September 2011, in which troops in one location were put through and immersive contact scenario with members of an Afghan village (represented by native language speakers located in other US Army bases). Observer / trainers were able to monitor proceedings from other centres, and provide exercise objectives and feedback for the participants. 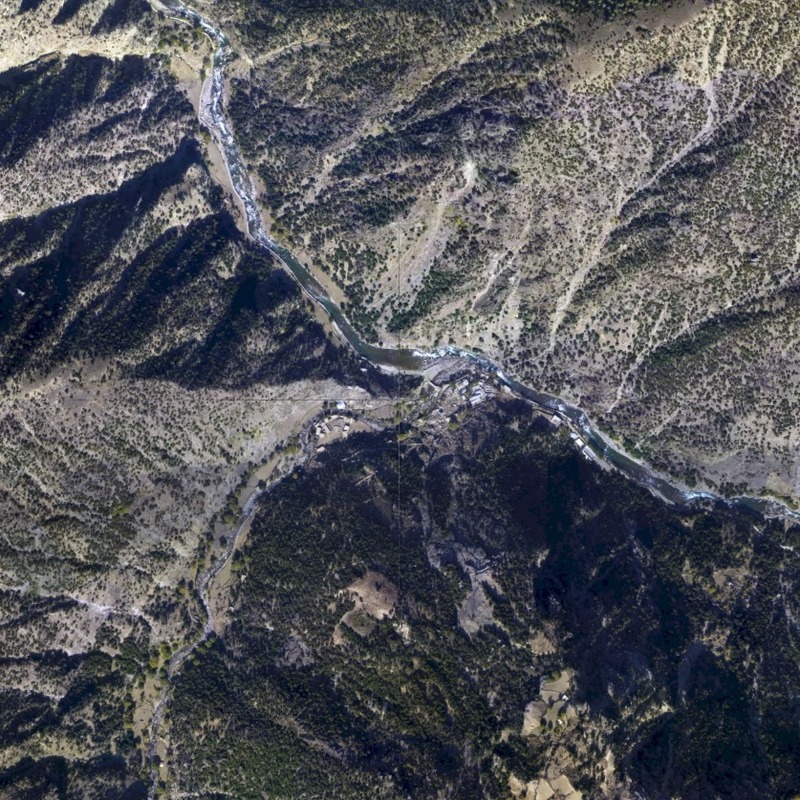 The use of SLE covered a similar field of study, with the product being used to create aspects of the Afghanistan terrain for training and simulations study. Of particular interest to the team was a mix of the platform’s content creation capability and the ability to deform and model the terrain to suit their requirements combined with the fact that virtual worlds are entirely non-deterministic, or as Maxwell put it, “We set the goals, not the makers of the virtual world”. 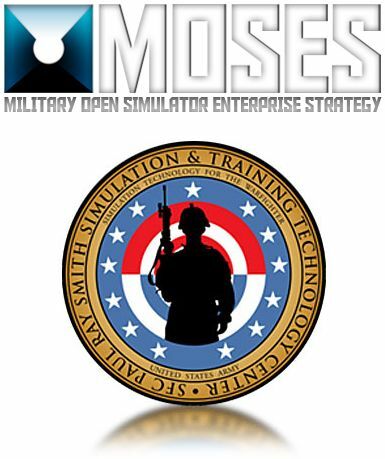 Thus was born MOSES – the Military Open Simulator Enterprise Strategy – with the aim of evaluating whether OpenSim could in fact meet and exceed the capabilities originally being developed within the SLE product, with the goal of providing a persistent and stable virtual world incorporating VOIP, base content, mesh, media on a prim, and monitoring tools. MOSES currently comprises some 117 regions running on standard OpenSim software and HP servers. Additionally, the team brought online assets from The University of Central Florida’s STOKES High Performance Computing Center, which allow them to run Intel’s Distributed Scene Graph (DSG). This in turn allows them to tun up to 1,000 avatars on super sims. The environment had its official debut at the U.S. Defense GameTech Users’ Conference, held in March 2011. MOSES initially hosted the content originally created in SLE (safely exported prior to the licences expiring), which included some 36 sims modelling terrain common to Afghanistan. However, it quickly grew far beyond that. Some 18 sims have been assigned for use by the US Air Force and at least four for use by the US Navy. Nor does it end there. This is because MOSES isn’t restricted to purely military uses. Indeed, unlike SLE, rather than sitting behind a hyper-secure firewall, it’s sitting on the open Internet. Maxwell cites two reasons for this. The first is purely practical for the project: “MOSES is on the public Internet … to allow us all to expand, more efficiently, best practices in using Open Simulator and 3D Web virtual environments,” he said, talking to Sitearm Madonna about the work. The second reason is a little more philanthropic: Maxwell saw a need to offer a safe haven for others in the same situation he’d found his team in with the loss of SLE. “I knew of many users in the military, industry and academia who were in the same dilemma as myself – how do we preserve the content?” he explained to his NPC audience. Thus, MOSES provided a way for other groups and organisations to migrate their work. Accounts can be obtained by visiting the MOSES website and registering interest. All requests are vetted by Maxwell himself in order to discover the level of interest, type of proposed use on the grid, and so on. While priority is obviously given to military projects, proposals don’t have to be within the military arena in order to gain access to the system. “If you’re developing or evolving some cool new kind of technology, like bots, for example, that would be clearly relevant to the MOSES mission,” Maxwell informed Sitearm. While the STTC provide a dedicated Viewer (based on Imprudence) pre-set to point directly to MOSES, any TPV can actually be used to access the system once a request for use has been approved. To help with communications and to provide updates and information, Maxwell has adopted the LL approach of holding weekly in-world Office Hours meetings. These take place every Friday at 15:00 EDT, and he encourages those using the platform to attend; “The weekly office hours are a great way to meet open simulator developers and our team. We usually have 20-ish in attendance”. He also added, “It’s important to remember [that] MOSES is a research and development environment, not an operations environment. We will keep upgrading the platform, for example, as we learn new improvements in using OpenSim”. Certainly, as a dedicated research environment enjoying the benefits of controlled access, MOSES offers significant attractions to those carrying out virtual world related research and study. The project itself stands, as Maxwell himself commented when talking with Sitearm Madonna, “As carrying on the tradition of military research contributing to the public good”. Those wishing to learn more about MOSES can contact Douglas Maxwell via the MOSES website or via e-mail at: douglas.b.maxwell-at-us.army.mil. With grateful thanks to Sitearm Madonna for additional material, quotes and credited images.